Our grid at Castle Combe once again proved to be our biggest of the year, and although slightly down on previous years did not follow the level of downward trend experienced at most of our other meetings, this year. The programme shows 32 entries, although I note that the anticipated late entry Jaguar C -Type did not appear in it, but then it didn't materialise at the meeting either, sadly. There were unfortunately a number of entries that didn't appear - Glenn and Rory Tollett in their lovely MGA Coupe, Tim Stamper in the Aston Martin DB2/4 and Alan House in his Morgan +4. However, a welcome late entry from Kevin Kivlochan in his AC Ace created a full team of AC Aces. 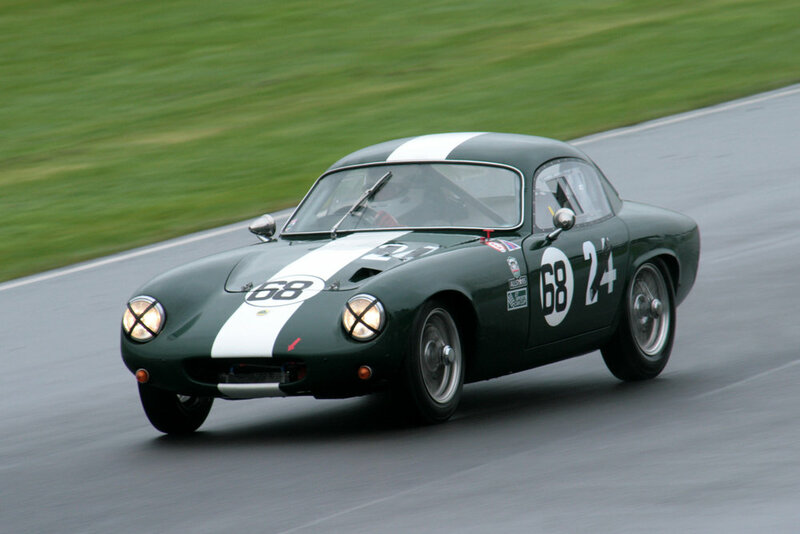 Marc Gordon substituted his Jaguar XK 150 for a Lotus Elite, which whilst it deprived us of any big cat entry, did bring the Elites up to a full team. I was somewhat alarmed to note that one Mark Williams had entered but since he turned up without his cue but with Mark Hoble's Triumph TR3, I am able to record that this was a programme error! We welcomed 4 newcomers to our ranks. Richard Tyzack in the Kellison J4R, a Chairmans class car, and although I was a little concerned at the potential performance of this 4.6 litre V8 machine, it was lovely to see a new exciting shape on the grid. Andrew Davenall joined us for the first time in the ex Chris Gawne Lancia Aurelia so that with the entry of Jason & Louise Kennedy's similar car, we had a brace of these classic Italian GT machines on the grid. Marc Mezey had entered his Austin Healey 100/4 and, last but not least, Peter Bower entered his Frogeye Sprite, imported from the USA and which sported an unusual bonnet. This gave us, for the first time, 3 under 1 litre Frogeyes on our grid since Neil Cameron and John Tewson had also entered theirs. I think it was also probably the first time that we had 4 FISCAR FLIERS - LECo, Connaught, Kieft and Arnott Lea Francis -in one race and they were able therefore to form their own team. The news story of the morning before qualifying even got going was that Chris Mann, who won't mind me mentioning, I hope, that he is in his 70s had, in the early hours of the morning, tackled a thief intent on stealing the Alfa Romeo Disco Volante from the trailer parked outside Chris's house. Having driven this miscreant off, and undaunted, Chris and his wife, Ellie, headed down to Combe where Chris took part in 3 races, 2 in the Disco Volante and one in his wonderful 1924 Alfa Romeo RL Targa Florio. Conditions, reminiscent of last year, attended qualifying, as the track was pretty wet again. Nevertheless, the status quo was maintained with Steve Boultbee-Brooks once again annexing pole. 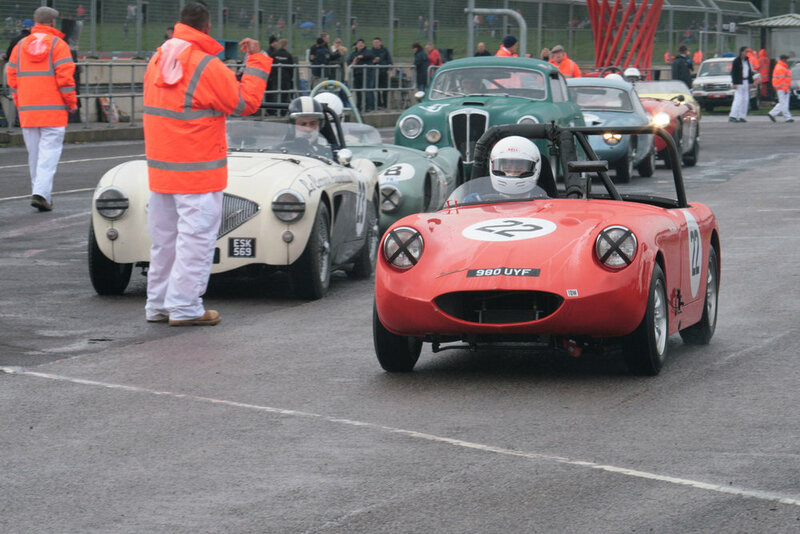 Alongside Steve on the front row, was Barry Dye's Lotus Elite with whom he was sharing his not so secret weapon, ARDS instructor, Richard Fores. Richard had been Robin Ellis co pilot when they won outright in 2014 in Robin’s Elite. Qualifying a superb 3rd was Kevin Kivlochan in his AC Ace Bristol with the similarly powered but very much starker shaped Frazer Nash Le Mans Replica of Martin Hunt, sharing with Patrick Blakeney Edwards, alongside. They always constitute a formidable driving combo. The third row was occupied by Marc Gordon finding the Lotus Elite much to his liking and the always competitive Nick Matthews in his Austin Healey 100/4. Robin Ellis was a little further back than I expected in his Lotus Elite in 7th place but I anticipated a higher finish from him and completing the fourth row was Martyn Corfield in his Frazer Nash Le Mans Replica. 9th was the AC Ace Bristol of Tim Pearce and rounding out the top ten was Paul Griffin who did a great job in the conditions in the Connaught, first of the FLIERS. The following rows were crammed with loads of wonderful cars from our favourite period. Paul Ziller and Mark Hoble circulated their TR2s closely together for the whole of qualifying. They occupied 12th and 13th, this time Paul having the edge. Richard Tyzack and Nick Taylor qualified the big Kellison 16th, thus allaying my fears for the time being! John Tewson was the first of the Frogeyes, qualifying 15th although I felt that Neil Cameron in 21st had more performance to come and Peter Bower was still finding his way in his new acquisition, down in 24th. Tristan Bradfield qualified Keith Hampson's Sunbeam Alpine Le Mans, 25th, Keith playing mechanic, on this occasion. They had passed me on the M5, with the Sunbeam on the trailer in the morning thus proving even on a motorway, I have become a potterer in old age! Brain Arculus was clearly keeping his powder dry down in 26th in the Giuliettta SVZ and Craig McWilliams must have been pleased that he had not qualified the little Kieft Climax last. That honour went to Arthur Smith -Fitchett in the Arnott Lea Francis but Arthur only did two laps so it was clearly not representative. It was wonderful to see these two early post war little sports racers alongside each other on the grid.